Special Offer: Buy Building a Rock-Solid Partnership With Your Board and Meeting the Governing Challenge together and receive a 25% discount. You’ll save more than $12 off the regular price. Use the Add to Cart button below to purchase both books. This powerful one-two combination will strengthen your governing body’s ability to produce truly high-impact governing work that makes a real difference in your organization. 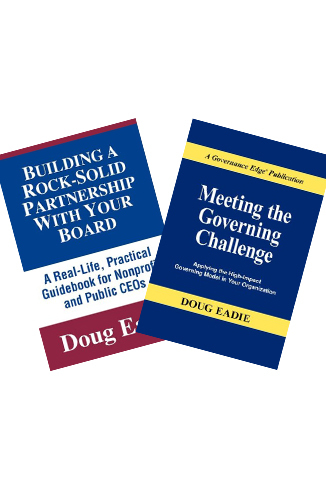 Meeting the Governing Challenge describes the five key elements of Doug’s High-Impact Governing Model—a powerful tool for developing the kind of board leadership and board-CEO partnership that your organization needs to succeed in these challenging times. Its companion volume—Building a Rock-Solid Partnership With Your Board—provides tested, practical guidance to help you manage the emotional/psychological dimension of the CEO-board relationship. Together these short volumes cut through the clutter to get right to the heart of high-impact governing.